The fourth instalment of our fairy tale inspired CAL - Happily Ever After is here. This week's granny square is the third medium motif. 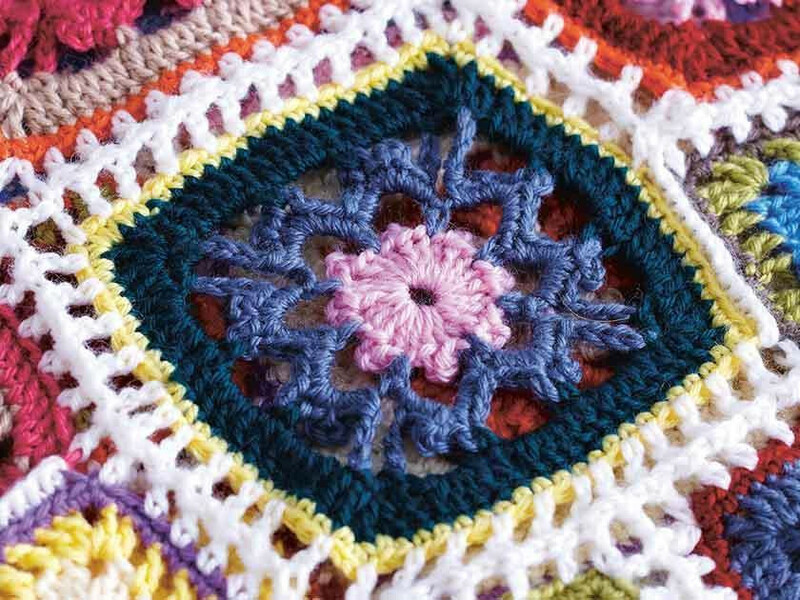 Worked in a series of double crochet and treble stitches, this floral centred square is a dream to crochet. For this CAL you will need Stylecraft Special DK (100% acrylic). 2 balls in each of Cream (Cream 1005), Green (Meadow 1065) and Fawn (Parchment 1218), 1 ball in each of Deep Pink (Raspberry 1023) and Pale Pink (Clematis 1390). 1 ball in each of Pale Blue (Cloud Blue 1019), Dark Grey (Graphite 1063) and Dusky Pink (Vintage Pink 1836), 1 ball in each of Mid Blue (Aster 1003), Pale Yellow (Lemon 1020), Dark Green (Teal 1062), Purple (Violet 1277), Orange (Spice 1711), Pale Grey (Silver 1203), Light Teal (Denim 1302) and Rust (Copper 1029). 3 balls White (White 1001). You will also need a size 3mm crochet hook. If you missed out on parts one, two and three, then don't worry you can still download it here. First round: With 3mm hook, make a slip stitch (slst) in your chosen colour, in this case it's Clematis (F). Pull loop tight on hook. Make 4 chains (ch), to do this, take yarn over hook. Pull through loop on hook. You will have one loop on hook. Repeat a further three times, making 4ch in total. Work 1 treble (tr) into fourth ch from hook. To do this, take yarn over hook. Insert hook into fourth ch from hook. Take yarn over hook. Pull through stitch (st), you should have three loops on hook. Take yarn over hook again. Pull through two loops. Take yarn over hook again. Pull through two remaining loops on hook. Work a slst into third ch from hook. Take yarn over hook. Work 3tr, picot, 7 times in same place as first tr. To begin the second round join new yarn, Denim (P) to any centre tr of any 3tr group and 1ch. Work a dc (double crochet) in the same st.
Work 1 dc in centre tr of next 3-tr group and then 6ch. Repeat the round referring to pattern. Finish with a slst. Then all in the 6ch, work 3dc. Then work 3ch and 3dc. Work 3dc, 3ch, 1dc, 3ch and 3dc all in next 6 chsp. Fourth round: Join new colour, Teal (L) to centre of any 9 chsp. Work 1ch, then 3dc in 9 chsp. Then work 4ch, miss the next 3 chsp and 1dc in next 3 chsp. Work 4ch, then 1dc in next 3 chsp. Then work 4ch and miss next 3 chsp. Repeat round referring to pattern. Work 1tr, 1ch, 1tr, 1ch and 1tr all in the next dc. Work 1tr in next dc and work 4tr in 4 chsp 3 times. Work 1 tr in next dc. Sixth round: Work 3ch, and 1tr in next tr. Work 1tr in 1 chsp. Work 1tr, 1ch, 1tr, 1ch and 1tr all in next tr. And then 1tr in chsp. 1tr in each of the next 18 sts. Repeat referring to the pattern. Seventh round: Join new colour and 1 ch. Work 1dc in same place as join, then 1dc in each of next 3tr, 1dc in next 1 chsp, 3dc in next tr, 1dc in 1 chsp and 1 dc in next 22tr. Repeat round referring to the pattern. Finish with a slst. Your fourth square is now complete. Make another 27 of these squares, omitting the 6th round on 4 of the squares. Don't forget to like our Facebook page The Knitting Network and share your progress over on the exclusive Facebook page for all of our Crochet-A-Longs. Check out the blog next Friday for the fifth instalment!